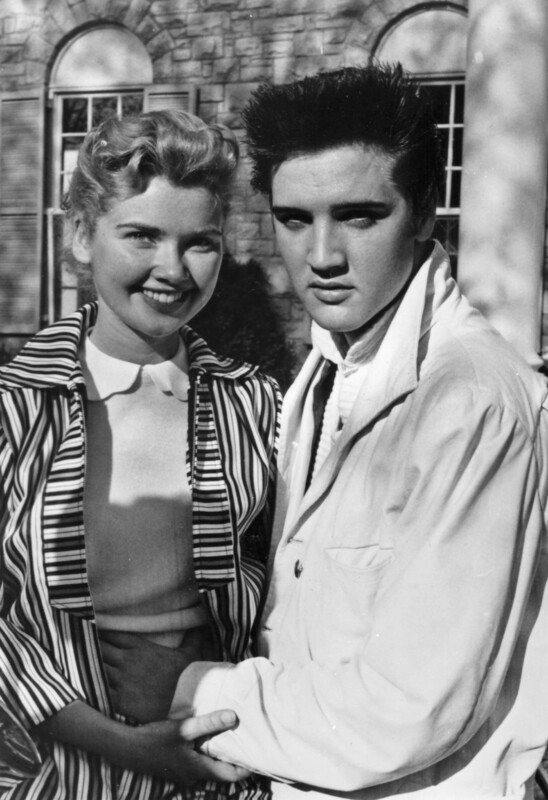 While filming Loving You in early 1957, Elvis dated an actress who had a small uncredited role in the movie, Yvonne Lime. 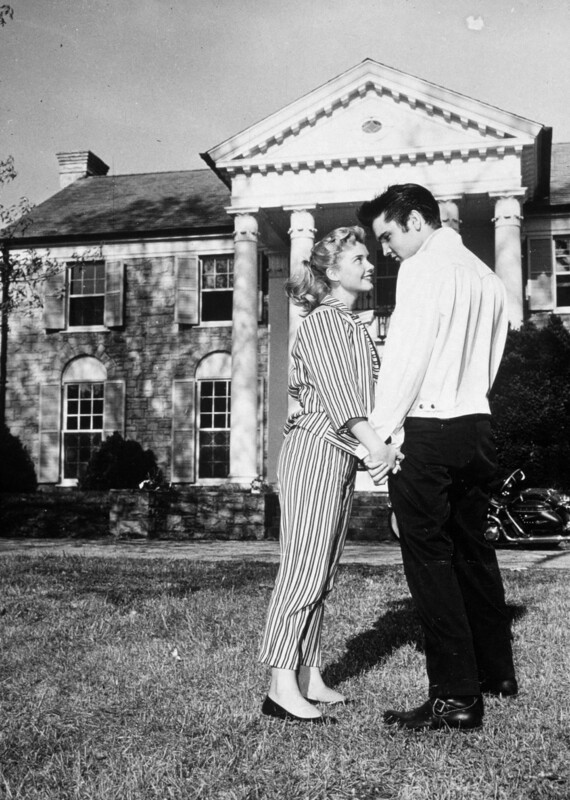 About a month after filming had ended, Yvonne spent Easter weekend with Elvis and his parents at Audubon Drive in Memphis. 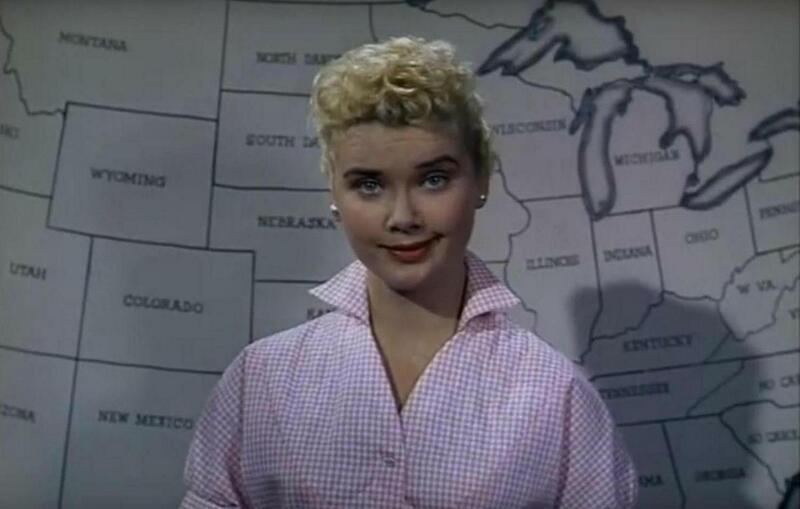 Yvonne had made her big screen debut in The Rainmaker, which starred Burt Lancaster and Katherine Hepburn. Coincidentally, Elvis’ screen test for producer Hal Wallis, in March of 1956, consisted of playing scenes from this movie, which also starred Wendell Corey, who played opposite Elvis in Loving You. During her stay with Elvis, Yvonne kept a diary, and she revealed her diary secrets in the August 1957 edition of Modern Screen in an article titled My Weekend With Elvis. By this time, Elvis and Yvonne were no longer dating. 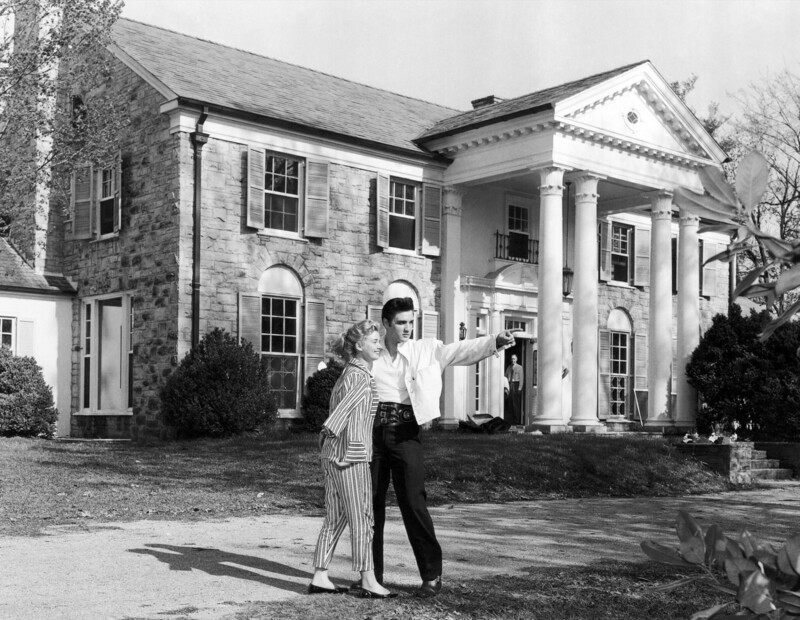 The 6-page Modern Screen article included 5 photos of Elvis and Yvonne posing in front of the recently purchased Graceland. These photos were taken by Memphis photographers E.H. Jaffe and Robert Williams on April 19, 1957. Interestingly, Yvonne does not mention this photo shoot in her diary. Other photos from this day also exist. In this topic you’ll find the full transcript of Yvonne’s diary, as published originally in Modern Screen magazine. Some incredible high resolution images from April 19, by Jaffe and Williams, accompany these diary pages. And as a special bonus, a short but very nice silent home movie of a party at Sam Phillips’ home, that Elvis and Yvonne attended on April 20, is also included. Some of the photos presented below, were kindly contributed by Pål Granlund, David English and Erik Lorentzen. To the right we see Yvonne Lime as she appeared in Loving you. Friday, April 19, 3:00 a.m. Here I am, flying to Memphis to spend a weekend with Elvis at his home. I can hardly believe it! I’m up in the air in more ways than one. What will it be like to spend an entire weekend ─ every waking moment ─ with Elvis? And who would have dreamed, that day I met him, this would happen! 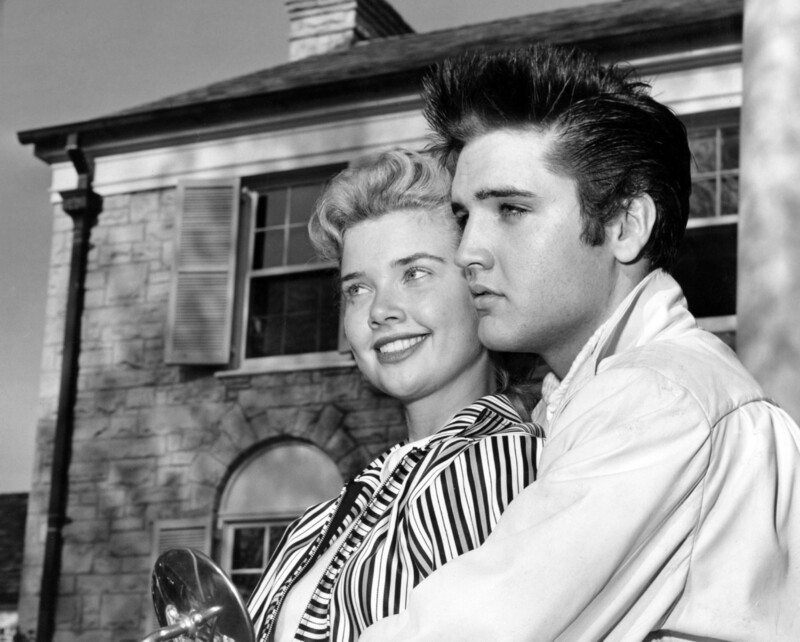 I met Elvis on the set of Paramount’s Loving You. I had a small role in it, a scene in which I talk to a group of teenagers in favor of Elvis. In the middle of the scene, Elvis came on the set and watched me. Did that make me nervous! Then when I finished, he came over and said, “Hi, I’m Elvis Presley”, as if I didn’t know. But I tried to act cool about it, because I knew that all the girls were throwing themselves at Elvis. So I just smiled and told him my name. Was I surprised when he said, “I know who you are. I saw you in The Rainmaker”. Then he told me a funny thing. He’d tested for the part that Earl Holliman eventually got, but the studio didn’t think Elvis was comedian enough for the role. 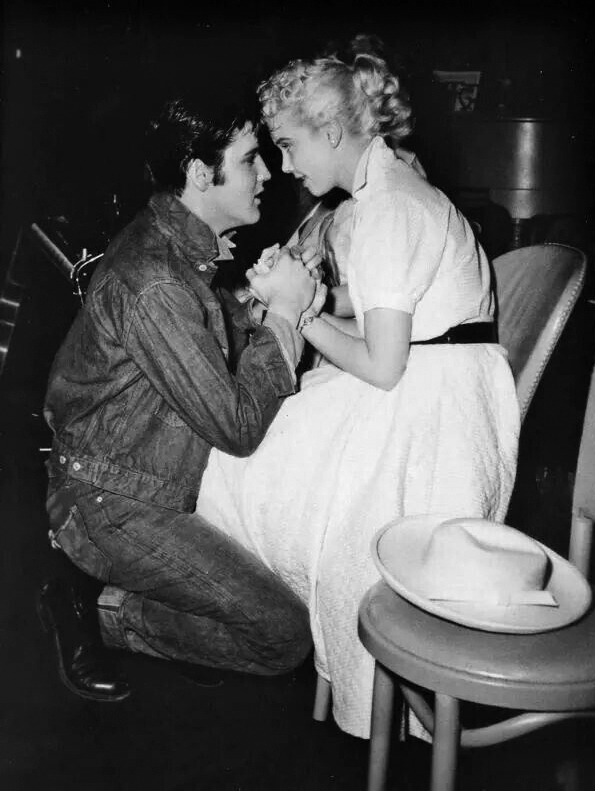 We talked quite a while then, and when Elvis had to start his next scenes he said, “Be sure you give me your phone number before you leave tonight”. I thought he was just saying that though, as a line. But the next day he caught up with me on the lot, and followed me around and waited on the set for me, and finally he said, “My folks are in town. I’d like you to meet them”. And that night I did. I also met his pal, Judith Spreckels, who writes those wonderful stories for Modern Screen. She’s swell. But getting back to right now. I never thought that day on the set would end up today on a plane! Especially after Elvis left Hollywood. That’s when he started begging me to come out to his home for a visit. Some of my friends tried to talk me out of going. They said that Elvis was fickle and I’d just be another one of all the girls in his life. But how could I explain how he sounded, calling me long distance night after night and begging me, “Honey, I miss you so much. Please leave Hollywood and come”. How could I tell anyone how sincere and lonely Elvis sounded? They think of him as a big-shot, as the great Presley, not as the warm, sweet boy who has told me he cares for me. But I’ve got butterflies in my stomach now. Only a few more hours and we’ll be together. What will he be like now? Will my friends be right, or I? This had been the biggest day of my life. Elvis has just kissed me good night and my head’s still spinning just thinking of the glorious day I spent with Elvis from morning till night! My plane was late, two hours late, and knowing how Elvis hates to wait anywhere because in a few minutes he’s mobbed, I figured. Guess his cousin Gene or the Colonel will meet me instead. But there he was, running toward me, sweeping me up in his arms and holding me tight as he kissed me long and hard! “Yvonne, honey”, he said, and his voice was low and husky, “I can’t tell you how glad I am to see you”. A big crowd had begun to gather around us, so we ran to Elvis’ shiny pink Cadillac. In the car, he kissed me again and put his arm around me. “I could hardly sleep last night, I was so excited about seeing you again, doll”, Elvis told me, and my heart began to hammer. “I was at the airport at six, but when they told me the plane would be late, I went home and had breakfast and came back again. Now that you’re here”, he added with that sweet grin of his, “I won’t let you go”. We drove to his home, a nice but modest one-story house with a black iron fence around it, and it was smaller than I expected. His parents were at the door and his mother put her arm around me and said, “We want you to feel at home here, dear”. Such warm people. As we walked into the house I noticed lots of packing cases all over the place. Mrs. Presley apologized, “They’re full of Elvis’ fan mail. We can hardly keep up with them. The mail is crowding the furniture out! That’s why we’re going to have to move into a bigger house”, she laughed. At that, Elvis winked and said, “Don’t tell Yvonne any more about the new house. I want to show it to her myself”. Elvis carried my bag in and showed me to my room. “It’s my bedroom, honey”, he said, “but I want you to have it so that you’ll be comfortable”. How considerate he is! A pleasant room, but so simple. Who would think that this room belonged to one of the biggest singing stars in the country? It’s painted a soft green with blond modern furniture and a king-size bed with a bookcase headboard. Over the bed is a large painting of Elvis which he told me had been painted by a fan. There’s a framed photo of Elvis on the dresser and next to it ─ I could hardly believe my eyes! ─ a photograph I had given him of me. In the corner is a record player spilling over with records and all those stuffed animals his fans send him. That’s when I gave him the little toy chicken with the little red cap on it ─ like the little red cap I wore in The Rainmaker which Elvis was always kidding me about. I got such a kick out of the way he put it on top of the bedstead ─ “The place of honor”, he had said, with a bow ─ and kissed me on my nose. “Now don’t fuss up”, he said, “just unpack, put on pedal pushers and we’ll get going. I want to show you my town”. I changed, and when I came out to the living room Elvis grabbed me and gave me a big bear hug. “Doesn’t my girl look sharp”, he said. “Come on, let’s go for a spin on my motorcycle”. When we walked out I was startled to find a crowd of girls outside. They looked me over and I began to feel embarrassed. They were calling out, “Elvis ─ oh, El-vis!”. Elvis smiled and waved. “Don’t let it throw you, honey”, he whispered. “I’ve been telling everyone in town that my girl was coming here this weekend and they want to see what you’re like. They mean well. You have to get used to this, just like I did”. 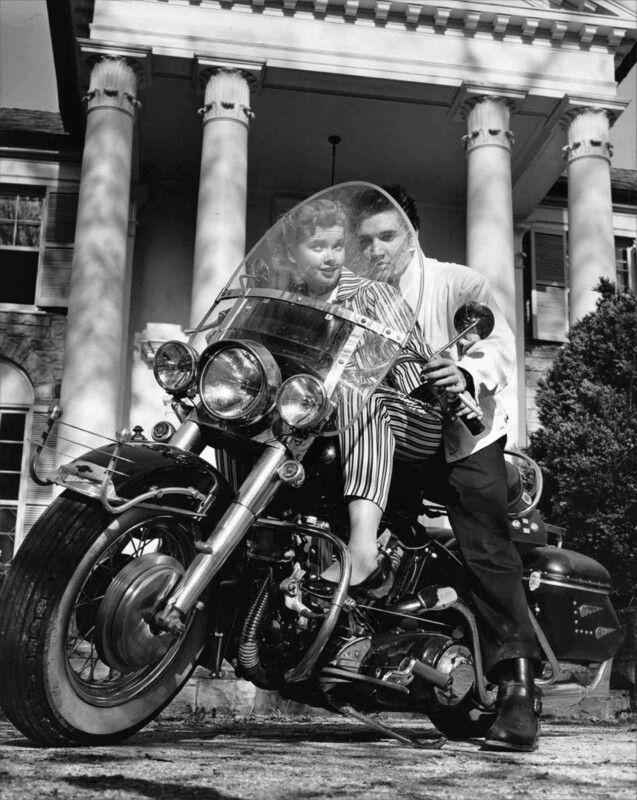 I got on the motorcycle in front of Elvis and he held on to me tight, and off we went. It was a thrill riding the motorcycle with Elvis. Elvis rode to the heart of the downtown section and parked in front of a barber shop. Everyone in the barber shop knew Elvis. “I’ve been giving the boy haircuts since his dad brought him in for his first one”, the barber told me proudly. A couple of Cokes later, Elvis was finished and back we went on the motorcycle again. “Now I’ll show you the surprise”. “What surprise?” I asked. But he wouldn’t tell me, he just kept grinning. He looked happy as a kid as we rode on and on to the outskirts of Memphis until we hit a section where the homes were large and beautiful with broad rolling lawns. We stopped in front of a magnificent white Colonial home that was surrounded by a flagstone fence. Elvis took me by the hand and led me inside. “How do you like it?”, he asked with a broad smile. “It’s my new home ─ for me and my folks. We’re going to move in as soon as it’s ready. I bought this mansion and we’re having it remodeled. To think”, he said slowly, “that we Presleys will live here. We’ve been poor so long, I can’t believe it yet”. And I can imagine the thrill he felt ─ to have known poverty so long and then to be able to buy a $100,000 home for himself and his parents. Then Elvis went on, “Only a few years ago I was driving a truck and I had to deliver something to one of these society families here. I came to the front door and the maid gave me a dirty look and said. ‘Go on to the back. You can’t ever come in the front door.’ “And now these people are practically my neighbors”, he said with a chuckle. He was like a little boy showing off a Christmas toy as he took me through the beautiful, enormous place ─ six bedrooms, a large foyer and workmen all over the place. He talked to one of them and said. “Can’t you speed it up? I’d sure like to move in before I have to leave for Hollywood for my next movie”. Then, back home again. We were so tired we didn’t bother to change for dinner. We all sat down at a long, narrow table in the dining room. It’s a very informal room, with a small piano in a corner. I sat next to Elvis; then there were his mother, father, his cousin Gene and a couple of his buddies. The maid, Alberta, served us meat loaf and mashed potatoes, and there was a lot of kidding around at the table. “Hope you like our dinner, honey”, Elvis said. “I’m always in such a hurry, It’s gotten so I only eat food that’s quick to eat, like meat loaf or sandwiches. Something like steak’s too much work!”. As far as I was concerned, just sitting next to Elvis, having him reach out and hold my hand between courses and lean over occasionally to give me a quick kiss, was enough. I would have been happy with bread and water. After dinner, Elvis wasn’t feeling too well. He’d developed a skin infection near his shoulder and it was acting up tonight. “Mind if we just stay home tonight, baby?”, he asked. “Anyway, you must be tired from your trip”. Elvis sat down and played the piano and sang. We had such fun as he jazzed up ‘True Love’ ─ and there was just lots of singing and laughing. Elvis and I began to dance and, since I’m a dancer, I wanted to teach him to bop. But he laughed and made for a chair. “None of that fast dancing for me”, he said. “I’d rather look at you”. We played some pool, and later we all sat outside on the walk in front of the house. It was growing dark and it was very peaceful sitting with Elvis and his parents, hardly saying a word. Elvis sat with me on one side and his mother on the other, and he held both our hands. It was real cute. “My two best girls”, he said tenderly. It took me back a couple of months to our first date in Hollywood, when Elvis had taken me and his folks to the movies to see ‘Giant’. Then also he had sat between me and his mother, and had held his mother’s hand with his right hand and mine with his left hand. I remember I had felt a tingle run through me at the time ─ just as I did tonight. A crowd of girls then came by the house. They’d call out. “Are you there, Elvis?”, and Elvis would reply, “Yes”. Later, when the girls had left and his parents had gone to bed, Elvis and I sat outside for a long time. “Are you going to be my little girl?”, he whispered. I replied, “Yes, darling”, but deep down, I knew it couldn’t be. After our very first date, we had sat like this in his car outside my home in Glendale. That was the night I first met them and we all went to the movies, Elvis and his parents and me. Later he dropped his parents off at the hotel and took me home. 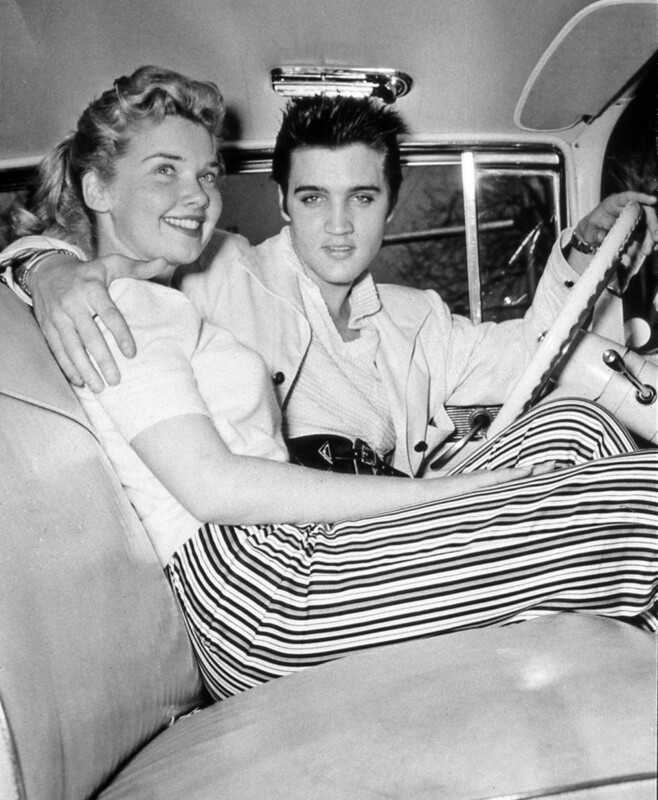 We changed our mind about stopping off at a restaurant for a hamburger because of the crowds, and Elvis and I had sat in his car outside my home for hours, talking, talking, talking. And now here we were again, talking about ourselves, our families, our religion, about what we wanted out of life. 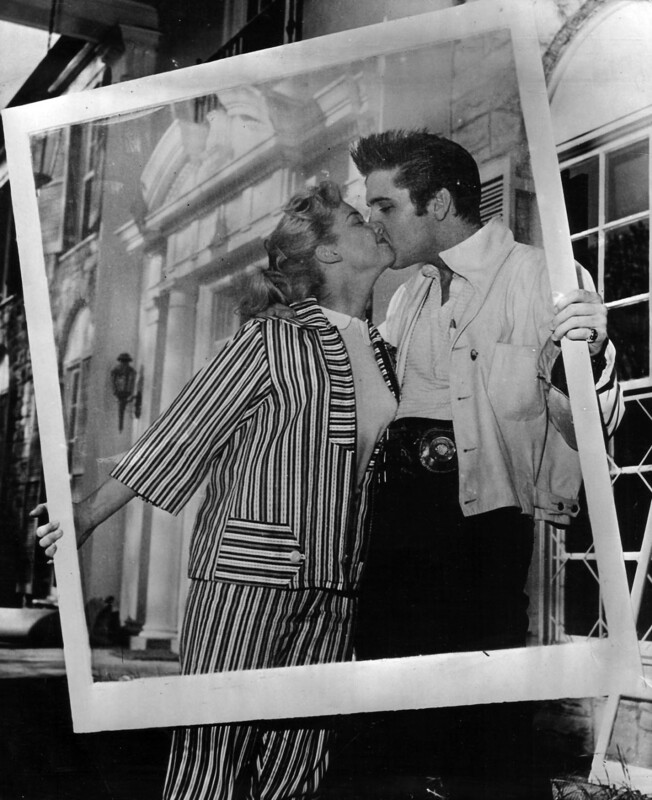 And I knew then, from what Elvis told me, that he couldn’t think of marriage ─ not for a long, long time. His career demanded all of him ─ too many people around him told him his fans would resent his marrying. As for me, I had told him that I was just beginning to get the picture breaks I’ve worked for since I was a child, and that my role as the flirt in The Rainmaker was leading to more good parts. And tonight, sitting with Elvis, I thought: any ordinary boy and girl could fall in love and make plans for the future. But not us. So when we walked into the house and he kissed me good night and said tenderly, “Good night, baby”, I knew that I must never let myself think that anything could come of it. Up at 10:30, and after a quick shower, I slipped into pedal pushers and went into the kitchen. His mother was there and she said, “I’ll wake Elvis now. He asked me to wake him as soon as you got up. He loves to sleep late when he’s not working”. When she returned she said. “He’ll be along soon. You know”, she added wistfully, “I worry about my boy, working too hard, going at too fast a clip, maybe ruining his health”. Just then Elvis bounced into the room, cheerful and handsome in black slacks and a white shirt with stand-up collar. He kissed me heartily and said, “What a wonderful morning ─ because you’re here”. He ate a huge breakfast of sausage patties, bacon, eggs, fried potatoes, hot rolls, coffee and milk. He even ate some of last night’s meat loaf warmed over! We sat around and read the papers to each other, and shot some more pool and maybe because I’m an actress ─ too ─ Elvis seemed to want to talk about career. He showed me a script MGM had sent him ─ Jailhouse Rock, in which he plays a convict. “I hope to do a better job than in my first movie. Say”, he added quickly, “would you like to see Love Me Tender? You said you’d missed it and wanted to see it. I’ve got a print of it here.” He set up the screen in the living room and we sat on the floor and watched it. While it was on he said a couple of times, “I hope I’m better in my next.” How surprising to discover that even a fellow as successful as Elvis has doubts and fears about his career! During the afternoon, lots of his friends dropped by ─ many of them to look me over, I think. He put his arm around me whenever anyone came in and introduced me ─ “This is my girl, came all the way from Hollywood to keep me from getting lonesome. Isn’t she a doll?”. Could it be that some of the girls gave me a funny look, like I was cutting in on their territory? Hope not! When we started back home, he looked happier and more relaxed than I’d seen him in a long time. Elvis was still in that peaceful mood when we got home. Even with all the noise and laughter, I could see that Elvis was feeling worse by the minute. He was unusually quiet, and his eyes began to get a sick look. I insisted that we go to the hospital and he finally gave in. The doctor gave him some penicillin pills and told us that would help clear the infection and he’d feel better. Elvis insisted he felt well enough for us to return to the party. Along towards two or three in the morning we were all sitting around the floor singing, and Elvis began to sing a religious song. It was raining, and in the darkened room ─ with only the flames in the fireplace flickering ─ it was a thrilling experience to hear Elvis’ mellow voice sing the hymns and spirituals he loves so well. Elvis sang on and on, until day began to break and it was Easter morning. It took us a while to get back to reality, but when Elvis broke the spell by kissing me and saying, “Happy Easter, honey,” we all got up and started moving. I went with some of the girls into the kitchen where we scrambled eggs. I cooked Elvis’ eggs for him, because I know that he likes his eggs cooked real well ─ almost hard as a rock. It was daylight when we got home, and Elvis kissed me at the door of my room and said, “This is a real happy Easter Sunday for me, baby.” And it certainly was for me! Got up late today ─ after one. It was a leisurely afternoon as we sat around and played records. Elvis said he was taking me to church services tonight at the Assembly of God. We were almost late, because Elvis wanted to go through his new house again, and for a special purpose. All of his relatives were waiting for us there. I met his aunts, uncles and their children, all dressed up in their Easter Sunday clothes. We stayed there a long time, as Elvis showed his relatives through every corner. We stayed so long that we didn’t have time for dinner before church. Elvis looked so handsome in a gray suit with dark tie. It was the first time I’d ever seen him dressed up this way, he looked wonderful. There was quite a bit of head-turning when we entered the church, and I could see the minister smile paternally as Elvis walked to his seat. Elvis is a deeply religious boy, but beause he’s on the road so much he can’t attend church regularly. This was his first time back in his own church in a long time, and the Rev. Hamel welcomed him back by including Elvis in his sermon. If I was proud of Elvis before, I was bursting with pride as I heard the Rev. Hamel talk about him in glowing terms and explain to the congregation how gratifying it was that their local boy, who had become such a worldly figure, had never lost his bond with God and his church. After the services, the kids clustered around Elvis and he signed autographs, then he whispered. “Excuse me, darlin’, I’m going to have a chat with the minister in his private room. Wait here, and I’ll see you later”, While I waited, the minister’s wife and several of the ladies in the congregation walked to me and told me about the Elvis they knew. Like the time they needed an extra boy for the church quartet and Elvis tried out ─ and was told, “Oh dear. You can’t sing well enough to make the quartet”. It was late when we got home and we were famished. So I made some vegetable soup, peanut butter sandwiches and coffee. We sat down at the kitchen table and suddenly he grabbed my hand and said. “Please don’t leave yet, darling. I know you’re supposed to go home in the morning. But can’t you stay for the rest of the week?”. But I couldn’t. I had several studio appointments lined up. I couldn’t resist the pleading look in his eyes, so I said I would stay one more day. We called my mother and Elvis spoke to her. Back in my room I had just begun to let my hair down when Elvis called out from the den: “My shoulder hurts terribly, honey. Can you put a hot pack on it?”. I slipped into a gold Chinese robe and didn’t bother to put my hair up again in the usual pony tail. When I walked into the den, Elvis was stretched out on a chair, but as sick as he felt, his eyes opened wide and he exclaimed, “Holy smoke, you look wonderful with your hair down like that. Always wear it like that ─ for me”. The hot packs made him feel better, and when I tiptoed out he had fallen sleep in the chair. Elvis hadn’t slept too well. When I got up. his mother said, “I just looked in on Elvis, and he’s fast asleep. I don’t think I’ll wake him yet.” Over a cup of coffee, Elvis’ mother said slowly, “You know, Yvonne, I have noticed for a long time that Elvis often looks lonely and sad. Even though people fall over themselves and crowd around him, he seems to be alone. I think”, she said wistfully, “it may be because he misses his twin brother”. When she noticed my puzzled expression, she went on, “I thought you knew. Elvis was one of twins, but his twin brother died at birth. Maybe it’s just a sentimental theory of mine, but I’ve often felt that without realizing it. Elvis misses the twin brother who died just before he came into the world. I think he was born lonely. Oh well”, she said briskly, “I’m just talking like a mother now. I’ll call Elvis”. When Elvis came in, the first thing he noticed was my hair. I was wearing it in a pony tail again. He asked me to take it down, as I’d worn it last night. So I smiled and unloosened my hair. Somehow, there was a sadness about today. We drove to the new house, and this time Elvis wandered through the empty rooms and said, almost to himself, “I have this beautiful home, but I wonder how much time I’ll spend in it”. He wanted to go to his retreat once more before I left. We held hands as we walked along the soft, green hills and over the rocks and bushes, plucking at the leaves. It was very still and we felt very much together. Suddenly a group of girls dashed out from behind a clump of bushes and ran toward him, screaming “There’s Elvis!”. As we drove away, Elvis said slowly, “Well, I’ll never be able to be alone there any more”. We didn’t say much the rest of the drive home. I packed after dinner, and then we drove to a drive-in place in town where the young crowd gathers for hamburgers and malts, and inside there’s a lot of fun and dancing to juke box music. We pulled up to the place, but Elvis parked in the rear ─ as usual. Elvis looked in the direction of the little restaurant and saw kids his own age laughing and clowning around. He looked with such longing I felt that he would have given anything to go in and join them. But we ate in the car. We drove around town and got to the airport a little after midnight. Elvis had begged me not to fly, because ever since he had a near-accident in a small plane during one of his tours, he’d developed a fear of planes. He doesn’t even like to walk inside one that’s on the ground. He kissed me outside the ramp and we made a promise to see each other when he came to Hollywood in a few days. I was sitting in the plane, feeling blue, when suddenly Elvis bounded in. “I’ll stay with you till it’s take-off time”, he said. We sat close, and silently wished we could hold back the hands of the clock. But soon it was take-off time, and Elvis had to leave. We clung in a long kiss, and then he was gone. As I’m soaring in the air right now, on my way back to Hollywood, I’m reliving the moments of my whole glorious weekend with Elvis ─ and thinking too of the warnings of my friends before I left: “He’s fickle. You’re just one of many”. And yet, come to think of it, Elvis forgot his phobia and got on the plane so that we could be together precious moments longer. And gosh, the thought of that makes me feel that maybe there was something special about my weekend with Elvis! ‘Innocent’ days. I remember those times! 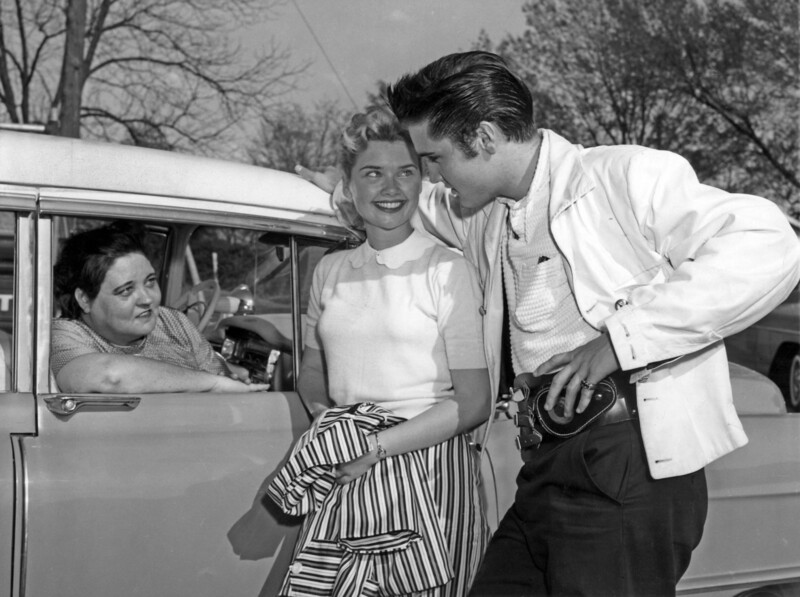 What a gentleman Elvis was back then. Great read as usual, and even greater pictures! Thanks for posting. A thoroughly enjoyable read and the photos and video were great. All this happened before I became an Elvis fan so this is a learning curve for me. Great read … I enjoy these stories about Elvis. Very sweet, even though I am sure there is a lot of embellishment and much poetic license. It is a story of its time and makes me love Elvis even more, if that is possible. An Easter week for the history books! The pictures are wonderful as well. Thanks very much! So wonderful reading! Elvis in his natural and lonely as his mother explained it so clearly. Thanks a lot for all this great posting !